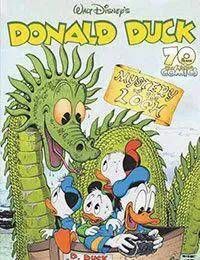 Donald Duck (2011) #363 continues from Donald Duck and Friends (2009) #362.Donald Duck (2011) #367 continues to Donald Duck (2015) #1 .<br />For starters, presented for the first time in the U.S. is the much-requested 1997 Carl Barks story - recently redrawn by Daan Jippes in the Barks style - titled Somewhere Beyond Nowhere. If that doesnt whet your appetite, feast on the Carl Barks classic Mystery of the Loch, reprinted in English for the first time in 16 years! And if thats not enough, enjoy the Geoffrey Blum/Carlos Mota fan-favorite Saga of Captain Duckburg - that may even feature Carl Barks himself! Featuring the never-before-seen cover for Mystery of the Loch by the legendary Don Rosa and a special variant featuring an oil painting by the legendary Carl Barks entitled Slow Boat To Duckburg!